SRP Federal Credit Union is proud to partner with Enterprise Car Sales. Preview their great selection of quality used vehicles or find the nearest Enterprise Car Sales location at cuautodeals.com. Finance an Enterprise vehicle with us and get rates as low as 2.99% APR*! APR=Annual Percentage Rate. Rates as low as 2.99%APR available for up to 36months. Payment example: $15,000 loan at 2.99%APR for 36months has a monthly payment of $437.00. Rate may vary depending on individual’s credit history and other factors. Refinancing restrictions apply. Credit qualifications apply. Programs, rates, terms and conditions subject to change without notice. Not all buyers will qualify. SRP FCU Membership required. Federally insured by NCUA. 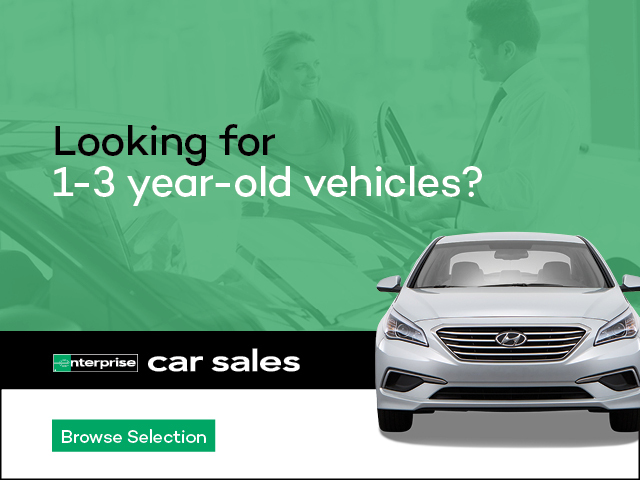 Offer valid only on Enterprise Car Sales vehicles purchased January 1-31, 2019. Cannot be combined. Used vehicles were previously part of the Enterprise rental fleet and/or an affiliated company’s lease fleet or purchased by Enterprise from sources including auto auctions, customer trade-ins or from other sources, with a possible previous use including rental, lease, transportation network company or other use. Photo for illustration only. The "e" logo and Enterprise are trademarks of Enterprise Holdings, Inc. All other trademarks are the property of their respective owners.©2018 Enterprise Car Sales.